In this series of posts, I will introduce the concept of telephony war dialing along with techniques to perform such assessments. Initially, we need to describe “war dialing” and its practical application. In order to serve this justice, we need a short history lesson on telephony. Decades ago, prior to the ever ubiquitous Voice over IP (VoIP) bundles provided by megalithic companies such as Verizon or Time Warner, we had American Telephone and Telegraph (AT&T). AT&T had a monopolistic reach on the analog telephone circuit switched network. As such, everything was interconnected via central offices, tandems and switches such as the Crossbar. Essentially, voice communications were interconnected geographically, similar to how we route data packets in modern day. However, voice was not the only payload transmitted across the analog wire, so was data. Organizations leveraged what was referred to as Data Conditioning Equipment (DCE) in order to connect and communicate with Data Terminal Equipment (DTE). This can be thought of as synonymous with our cable routers (DCE) connected to our computers (DTE). Specifically, the DCE devices - in this case we are referring to modems - were tied to an endpoint that was associated with a particular landline phone number. Two modems, one sender and one receiver could negotiate baud rate and establish a data transaction. Modems can be considered connected nodes on a network; albeit, the external access network is different than the internal connected network. Modems are typically connected via existing analog landlines and are often used as a method to gain access to a system and/or network using out-of-band access in the event that traditional IP packet switched networks become unavailable. 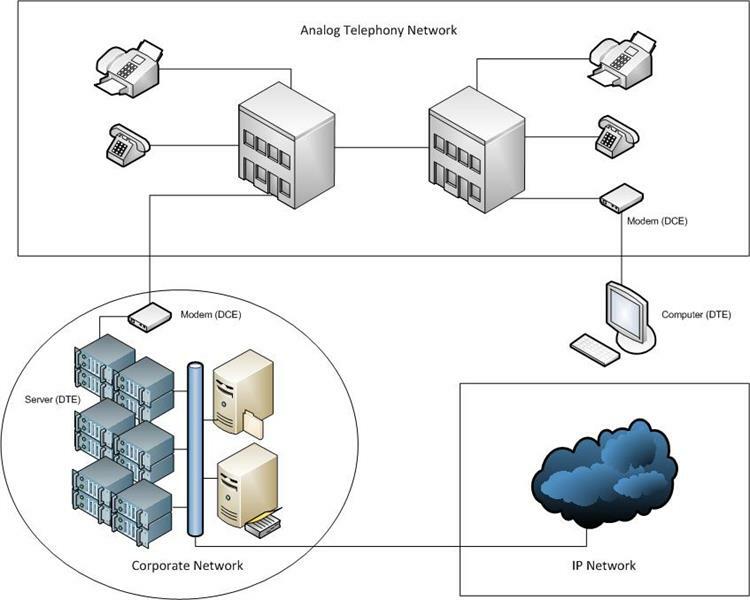 The following illustration provides a high-level depiction of an analog network and an IP-based network. It’s also the point in which both transport methods converge within a central network, such as a corporate datacenter or enterprise network. The term “war dialing” is used to describe the technique of auto-dialing phone blocks, disparate or contiguous ranges, in an attempt to locate available modems such as the ones located in the corporate network on the previous illustration. The modems are then inspected for insecure configurations in an attempt to gain access to the target system and/or network. This is something that we do quite often at FishNet Security as a standalone service or in conjunction with blended assessments, such as our Breach Assessment. Let’s get to how we war dial when we have VoIP and analog networks to contend with. The following list of components will be used to set up our war dialing environment. Since it is becoming very rare to actually have a native analog line at our disposal, we are going to shovel packets across a VoIP transport; more about this later. In order to prevent dialing each number manually, we need to use an auto-dialer. Luckily, HD Moore created a very effective utility called Warvox2. 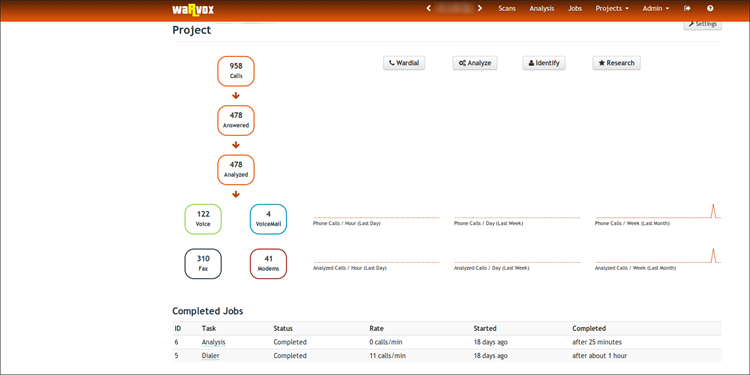 This is the successor to Warvox and adds some nice features, such as a custom IAX library and PostgreSQL database storage. Additionally, it allows for a fully featured Digital Signaling Processor, using the Kiss FFT library, in order to perform audio and frequency analysis. 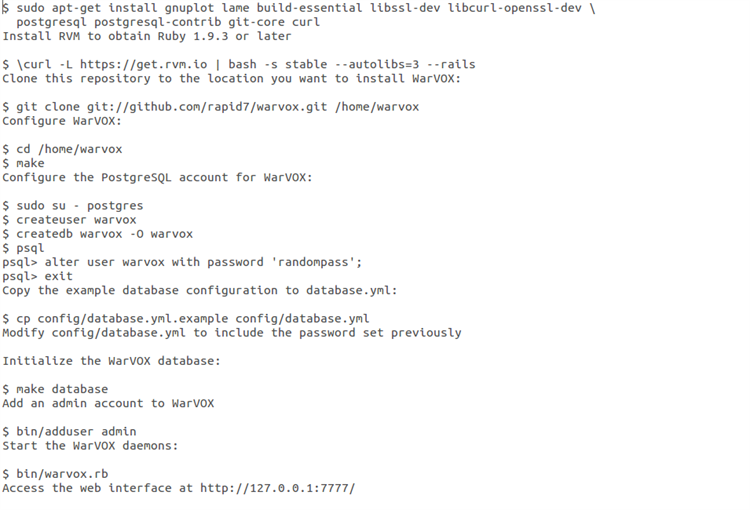 First we need to grab Warvox2 from the GitHub location, https://github.com/rapid7/warvox/. The GitHub site claims that the following “install process is not ideal at the moment”; however, it works well and is really straight forward. As the installation states, we should be able to reach the web server at 127.0.0.1 on port 7777. I have an internal system in which I don’t care if Warvox2 is bound to all the interfaces, so I enter 0.0.0.0 in order to do so. Alternatively, the IP of the interface is probably more appropriate here. With that done, let’s navigate the application. First, we need to add a service provider. 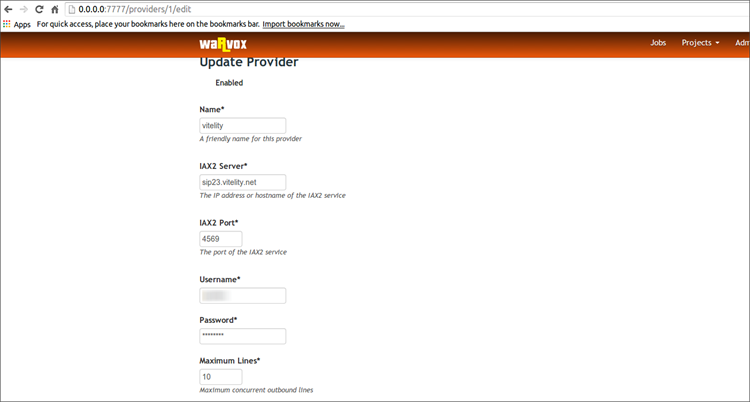 Warvox2 is intended to be used with an IAX protocol service provider. A couple of well-known service providers exist and offer “pay as you go” plans. The first is Vitelity, although, their IAX protocol support is undocumented, and they prefer to run native SIP trunks. The second is Teliax who offers native IAX protocol support. I personally use both and don’t have any issues with either. 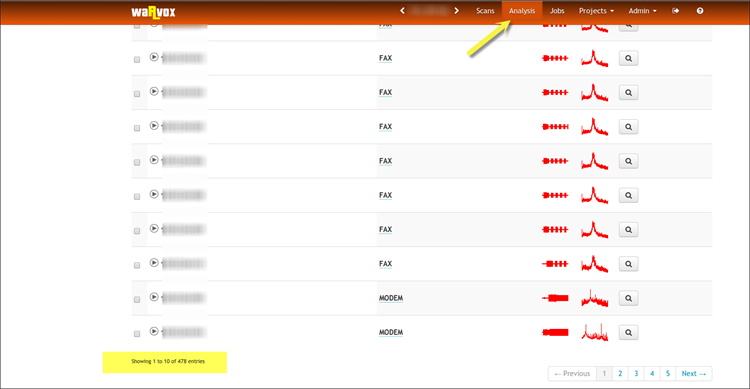 Note that the preceding illustration has a highlighted area that allows for the source Caller ID description. This can be a phone number of your choosing as both Vitelity and Teliax pass this number through on their IAX trunks and will appear on the recipient’s caller ID. However, “SELF,” if set instead of a number, will force the phone number being dialed to also be set as the source caller ID variable. This is important because some voicemail boxes will fail to open without requiring pin/password authentication, because it is assumed that the person is accessing their voicemail from their phone, locally. Set the SELF option; it still works, and we run into voicemail access quite often. Now we need to dial the numbers. We should see something similar to the following. Note that this is a project that was already analyzed hence the reason why the “analyzed” tones are included in the screenshot. Alright, so the analysis can take some time, so grab a Snickers and some Hi-Ball because Warvox2 has to run 53 seconds of audio capture multiplied by the number of phone numbers within the phone block and compare it to known audio patterns. There is a lot more to this process, and HD Moore has an excellent presentation titled Acoustic Intrusions on the topic that was delivered at the 2011 DerbyCon. Another problem that can be a bit time consuming is obtaining the results of the analysis without paginating through a seemingly infinite collection of pages. We’ll cover that in the next installment.